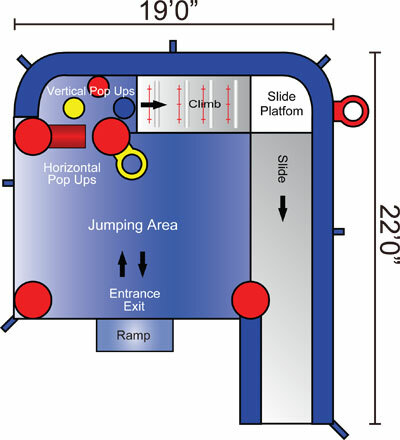 The Castle 7-n-1 Combo features a bounce house, climbing wall, slide, obstacles and two basketball hoops. This inflatable will provide endless hours of fun. It brings a neutral color scheme in an inflatable bounce with slide to life which makes this a fun atmosphere for any kid’s party. 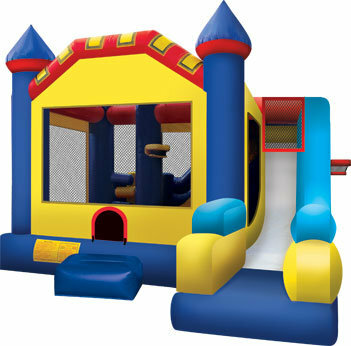 The kids will be greeted with by a high roof multi colored castle upon entering the 19’x22’ modular all-in-one bounce house combo with 418 ft2 of play area including a basketball goal inside the play area and on the outside, horizontal obstacle logs, vertical obstacle pop-ups, climbing ramp, slide, and large bouncing area. Invite the Castle 7n1 inflatable combo bouncer with all of its bright vibrant colors to your event for your guests who will have an amazing time with plenty of room for hours of bouncing and sliding fun. Our Castle 7n1 generic color themed large combo bouncer brings the inflatable fun delivered to you for all party guests ages 3 and up. Inflatable all-in-one bounce house with slide combos are a perfect way to combine fun and healthy activity all while adding a centerpiece for any kids birthday party, school festival or company picnic!